In 1983, Australian doctors J. Robin Warren and Barry Marshall isolated Helicobacter pylori, the bacterial cause of peptic ulcer disease (P.U.D.). However, decades passed before most doctors prescribed antibiotics to their afflicted patients. Why didn't the medical community hit itself on its collective head? After all, most bacterial diseases had been discovered a century before during Robert Koch's golden age of bacteriology. Why didn't doctors laud Warren and Marshall for their findings? Why didn't long-term ulcer-sufferers champion Warren and Marshall's discovery that with a standard course of oral antibiotics, patients no longer have to swig antacid, feel guilty for leading a stressful life, or massage their stomachs through their coats to distract from their ulcers' gnawing pain. Understanding these questions reveals how complex scientific processes mold contemporary medical discoveries and their reception. In 1857, William Brinton was one of the first doctors to describe the stomach ulcer. But without diagnostic tools such as endoscopy and X-rays, ulcer detection remained difficult. Ulcers were absent from the 1899 first edition of the Merck Manual, the bible of diagnosis and therapy. Throughout the beginning of the twentieth century, doctors began to recognize ulcers as an infection, treating the condition with antacids or surgery. But, because scientists could find no causative agent, this "focal infection" theory became pass&eacute;. As with cancer, stroke, and heart disease, the three most common killers in mid-twentieth century America, there was no single associated single germ. Therefore, the tide turned to the study of psychic and environmental factors. Eventually, theories about infection and dyspepsia gave way for a theory that diet, smoking, and stress cause ulcers. Medical studies relating psychic stress and peptic ulcers became such a deeply entrenched part of American culture that as doctors, Arvey Rogers and Donna Hoel write, "A peptic ulcer used to be a badge of success. Up-and-coming professionals' were expected to earn one,and if they didn't maybe they weren't working and worrying hard enough". Over time, this theory evolved into a more general conception of the etiology of ulcers, in which people with heightened stomach acidity were at risk. This theory of the acid-induced ulcer still enjoyed cultural as well as medical esteem in the late 1970s. Most doctors thought that the stomach was sterile because of its high acidity. Around this time, doctors also observed a correlation between the use of non-steroidal anti-inflammatory drugs (NSAIDs) and ulcers. When pathologist J. Robin Warren found curved bacteria in the biopsy of a dyspeptic stomach on June 12, 1979, the world was not ready for his discovery. Sure, the discovery of NSAIDs as possible ulcer triggers allowed for a multiplicity of ulcer-causing agents. But, the discovery that a bacterium was one of these agents recalled debunked work from the beginning of the century. Interestingly, Warren was not the first to observe spiral gastric bacteria: Italian pathologist Giulio Bizzozero observed them in 1893. However, because nobody could culture these bacteria, the paradigm of the stomach's sterility took hold during the twentieth century. Looking back, Marshall understands the medical community's reluctance to embrace his new theory as a byproduct of ingrained ideas about the etiology of ulcers. Marshall hypothesized the pathogenesis of Warren's spiral bacteria at a time when this idea was a medical taboo. After Warren approached him in 1981 with the bacterium, Marshall generated a list of questions about the organism to guide his subsequent research. In his 1983 letter to Lancet, the first public communication of his findings, Marshall asked about these bacteria, "Why have they not been seen before; are they pathogens or merely commensals in a damaged mucosa?". One speculation for Marshall's ability to understand gastric bacteria as potentially harmful was his young age. Paul Thagard points out that Marshall, who had only started gastroenterology in 1981, "did not require abandonment of a set of well entrenched beliefs that conflicted with the new ideas". In contrast, other more established medical researchers and practitioners had beliefs about the nature and treatment of ulcers that clashed with the new hypotheses and led them to reject them summarily. Of course, in medical school, Marshall had learned the medically accepted ideas about the nature and treatment of ulcers. Still, Thagard maintains that Marshall's position as a gastroenterologist-in-training allowed him to think more openly about the etiology of peptic ulcer disease. The discovery of the bacterium Helicobacter pylori, originally named Campylobacter pyloridis (C. pylori), dissolved the medical belief in the stomach's sterility. However, doctors were reluctant to accept that this bacterium might be harmful. In 1982, the Australian Gastroenterological Society rejected Marshall's study, published in The Lancet 1984 as groundbreaking work. The study showed that that all subjects infected with H. pylori exhibited gastritis and all subjects with duodenal ulcer were also infected. But because of the rejection, Marshall felt "very depressed about our first failed attempt to present our work on H. pylori". As Paul Thagard notes, gastroenterologists were less receptive to the bacterial theory of ulceration than microbiologists. At the Second International Workshop on Campylobacter Infections in Brussels, where Marshall next reported his findings, microbiologists began research projects to find the bacteria while many gastroenterologists scoffed, calling Marshall's theory "preposterous". Marshall and the international medical community had to generate more evidence before gastroenterologists would admit the relationship between H. pylori and ulcers. While gastroenterologists may have held firm beliefs about the impossibility of pathogenic bacteria in the stomach, microbiologists held no such bias. Nevertheless, Marshall felt determined to gain the support of gastroenterologists. As Marshall reflects, "In my naivet&eacute;, I expected H. pylori to be immediately accepted as the cause of duodenal ulcer and gastritis". But for ulcer-sufferers to receive proper therapy, Marshall still had work to do. A drawing of the H. pylori organism. The Gram-negative spirillum measures about 3.0 by 0.5 micrometers. Its four to six flagella power it. Source: Concrete Bob Software. With the scientific community's back facing him, Marshall needed to culture the bacterium and show its virulence. This may sound like tedious work, but compared to typical science research today,large scale projects with complex funding and lists of coauthors from several continents,Marshall's story has the same thrill as tales of nineteenth century microbe hunters slugging down virulent bacteria or exclaiming "Eureka!" over a speckled Petri dish. Like in Alexander Fleming's post-vacation discovery of penicillin, serendipity enters into the story of H. pylori. Steward Goodwin, the microbiologist Marshall assigned to culture the organism, was struggling to get results. He had already incubated thirty-four bacterial cultures, and each turned out barren. But during Easter, a five-day holiday in Australia, the thirty-fifth culture incubated undisturbed. When Goodwin returned from holiday, he discovered H. pylori bacterial growth. Goodwin's account of his work invokes the great nineteenth century chemist and microbiologist Louis Pasteur when he writes, "The culture of H. pylori was not an accident, as stated by some; but it was fortunate that in Perth a 5-day holiday occurred during the project, and so demonstrated that chance favours the prepared mind". Regardless of how one chooses to apportion credit between Goodwin and Lady Luck, H. pylori was alive and growing. But how would Marshall show that this bacterium was dangerous? One wonders if Marshall knew the story of Max von Pettenkofer, a rival of Robert Koch's who believed that bacteria were harmless. In an effort to prove his belief, he tried to ingest the bacterium now known to be the cause of cholera. Pettenkofer's assistants, fearing for his life, thwarted his attempt. When he later became convinced that his life's work was wrong, Pettenkofer committed suicide. Marshall, who wanted to demonstrate the opposite of Pettenkofer's belief, needed somebody to ingest H. pylori. Marshall believed that the bacteria would cause gastritis and possibly a peptic ulcer. So, in what now seems perhaps altruistic, perhaps daring, and perhaps terribly male, Marshall and another volunteer swigged down an H. pylori cocktail. As Marshall dryly writes, "One of the main difficulties with the H. pylori theory was our inability to develop an animal model disease.In July 1984, I drank a pure culture of H. pylori (109 organisms)". Sure enough, Marshall became ill, underwent an endoscopy and demonstrated that bacteria crowded inflamed portions of his stomach, although his gastritis spontaneously resolved itself and no ulcers developed. Still, this event provided perfect fodder for entertaining popular accounts. Popular accounts now emerge: a special heroe's edition of U.S. News & World Report headlines an article on Marshall with "A Gutsy Gulp Changes Medical Science"; a Bulletin cover article puns "Gut Feeling Brings a Great Discovery"; an editor writes in the first edition of The Journal of Theoretics, "I hope that through this journal, a rational evaluation of new theories may be accomplished in a more thoughtful and less painful process than Dr. Marshall endured". Even with all the media attention, Marshall still felt surprised by the delay. He writes, "In 1983, when the H. pylori hypothesis was developed, I was certain that it would immediately gain universal acceptance and that within two years peptic ulcer therapy would be essentially an antimicrobial regimen". This was far from the case. A 1986 book on Peptic Ulcer and its Drug Causation lends a page to the bacterial hypothesis, noting, "Whether these bacteria have an aetiological role in peptic ulcer gastritis is unknown". At this time, doctors still prescribed drugs to reduce stomach acidity and monitored patients for complications. Marshall's self-experimentation failed to prove that H. pylori cause ulcers, although it did link the bacteria with gastritis. As epidemiologists began finding H. pylori worldwide in ulcer-free patients, it seemed that nobody could prove the cause-effect relationship. As Marshall commented in retrospect, "Although the pathologist looking at the biopsy of the stomach can see that gastritis is present, it is true that most people with H. pylori are clinically well. This fact is still the main paradox for H. pylori disease". This problem was the essential dilemma for Marshall in generating enthusiastic medical support for his hypothesis. He says, "It would have been a simple matter to convince skeptics of the importance of H. pylori if the bacterium was confined to patients with peptic ulcer". The grand task of demonstrating the pathogenesis of H. pylori required the work of many researchers worldwide. Proof is a tricky concept in medicine. Because of the difficulty in inducing ulcer disease in animals experimentally, researchers struggled to demonstrate the pathogenicity of H. pylori. In 1988 as many researchers were working on understanding H. pylori, Marshall, Warren, Goodwin, and others published a study of duodenal ulcer to examine the rates of relapse upon eradication of Helicobacter pylori and without eradication. This study, along with several others, found that the bacterium "is the most important aetiological factor so far described for duodenal ulcer". However, as Rauws and Tytgat, authors of another study, state, "This study does not prove that H. pylori is the cause of duodenal ulcer disease". They go on to insist that the eradication of H. pylori is a way to lower ulcer relapse rates. During this time of ambiguity, clinicians were left with a conundrum. As Deltenre, Dekoster, Nyst, and Glupczynski state, "Some years ago, the treatment of infection by Helicobacter pylori (HP) used to be an ethically embarrassing problem because no one could be sure whether the organism was a commensal or a true pathogen for gastroduodenal mucosa." While most texts from this "embarrassing" period in the 1980s flatly state that more information must be gathered before scientists could recommend treatment of the infection, clearly enough evidence had accumulated that many doctors considered treating the infection with antibiotics. As one doctor asks in the forward to a 1988 text on peptic ulcers, "Campylobacter remains somewhat of an enigma: is it a pathogen causing a certain form of mucosal disease, or is it an epiphenomenon?". For the doctor treating patients with recurrent ulcers, this enigma leaves little indication about whether or not she should prescribe antibiotics. Apparently, even after 1990 when the textbook authors distanced themselves from this "ethically embarrassing problem," only 1% of doctors treated H. pylori infections with antibiotics, according to a study by Munnangi and Sonnenberg. However, the proliferating work on Helicobacter pylori continued to support the pathogenic role of the bacteria because of decreased recurrence rates of ulcers upon eradication. In February of 1994, The National Institutes of Health (NIH) Consensus Conference examined the role of Helicobacter pylori, and determined that infected ulcer patients should be treated with antibiotics and antisecretory drugs. However, even after the 1994 NIH report pronounced that antibiotics should be used in the treatment of ulcers, some doctors maintained that H. pylori should be innocent until proven guilty. For example, John Graham's 1995 Lancet article "Helicobacter pylori: Human Pathogen or Simply an Opportunist?" challenges the NIH report and the cause of H. pylori eradication. Part of this reluctance to view H. pylori as a pathogen can be explained cognitively. Thagard asserts, "The hypothesis that ulcers are caused by bacteria requires reclassification of [peptic ulcer] disease as an infectious disease, where previously it was viewed as caused by acid imbalance and was sometimes even classified as psychosomatic." Reclassification, according to Thagard, "involves moving a concept from one branch in the tree of concepts to another branch" - steep barriers to reclassification inhibit such changes. The NIH report actually set in place a new barrier to the acceptance of Marshall's theory. The report states, "Obviously, no patient should be treated for H. pylori unless one of the sensitive and specific tests previously discussed demonstrates infection". This was despite the fact that 19 out of 20 patients with duodenal ulcer had infections. Given the expense and invasiveness of the most accurate test for H. pylori infection-endoscopy-some doctors viewed the NIH's recommendations with confusion. A Dr. Mark Feldman was quick to point out that "current methods of H. pylori testing are expensive and have limitations, that antibiotics may have adverse affects (allergic and nonallergic) that can sometimes be serious, and that many effective, convenient, and safe ulcer medications are available to the practitioner". Therefore, doctors who use these approaches to duodenal or gastric ulcer "should not be considered old-fashioned". Apparently, this advice corresponded to the sentiments of the majority of American physicians, as the 1990s were a time of increased hesitance in the prescription of antibiotics. A study by Munnangi and Sonnenberg notes, "In 1995, about 75% of ulcers were still treated primarily with antisecretory medications, and only 5% received antibiotic therapy". The authors of this study display particular dismay at the treatment of ulcers in the United States. They state, "It is amazing to find that the majority of US physicians still do not treat peptic ulcer disease with antibiotics. The description of Marshall and Warren of H. pylori was first published in 1984. Most gastroenterologists became truly convinced that a bacterial infection played a crucial role in the etiology of peptic ulcer only after several studies had shown that antibiotic eradication of H. pylori prevented recurrences of peptic ulcer. It appears that the majority of European physicians are currently treating their ulcer patients with antibiotics". Two decades after Marshall's discovery of the link between peptic ulcer disease and H. pylori infection, the world still has ulcer-sufferers. For one thing, H. pylori is only one of several causes of ulcers. Likewise, treatment is imperfect, reinfection occurs, and treatment is not available to everybody because of limited resources. Today, Helicobacter pylori also remains a controversial topic for some physicians. Marshall acknowledged the persistence of ambiguity in 2002 when he received the Keio Medical Science Prize. He said, "Controversies that developed in 1983 are still relevant to H. pylori today". While some researchers maintain the role of stress, a 1998 article in the British Medical Journal suggests that "psychosomatic factors in the aetiology of peptic ulcer have become unfashionable since the discovery of Helicobacter pylori". These authors hint that trends, not scientific rigor, influence etiologies. Still, while many scientists were slow to accept Marshall's discovery twenty years ago, today most doctors regard ulcer management as greatly improved thanks to Marshall and Warren's discovery. Many patients no longer need to blame themselves for their ulcers. As Howard Spiro quips, a patient may now say, "It's not me, it's my mucus". As the Center for Disease Control points out through its public service announcements, the association of a bacterial infection with ulcers transforms the ulcer patient's experience. In one television advertisement, an old lady leaves the doctor's office ecstatic, cheering, "Yes, I have an infection!". In another, A businessman arrives home with flowers for his wife, calling out, "Honey, I'm home. And I have an infection!". These advertisements emphasize that as an infection, ulcers are curable: "Don't just control your ulcer. Cure it". Many recurrent ulcer sufferers have found antibiotic therapy as the lasting solution to their problem. The story of Helicobacter pylori's acceptance as a pathogenic agent reveals the fundamentally changed nature of medical breakthroughs. Scientific rigor requires that many experimenters take myriad approaches to the same problem of determining the pathogenic nature of a newly discovered bacterium. No longer can a medical researcher publish meticulous papers and create a highly public and theatrical display to prove his or her discovery as did some nineteenth century microbiologists. In part, changed laws of medical ethics prevent a modern reprise of Pasteur's heroic demonstration of his rabies vaccine through the vaccination of an infected boy. Because of the difficulty in establishing an animal model for H. pylori's pathogenesis, Marshall and others pursued an indirect approach in establishing a link between the bacterium and ulcers by proving decreased ulcer recurrence upon eradication of the infection. Eventually, the weight of evidence for the virulence of H. pylori swayed the majority of the medical community to prescribe antibiotics as a cure for ulcers. Since 1981, when Marshall first saw Warren's bacterium, treatment for ulcers has changed tremendously. Today, some scientists are developing H. pylori vaccines, although predictably, others question the cost-effectiveness of such a measure. 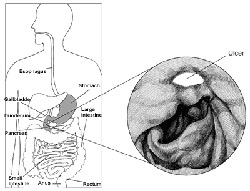 Nevertheless, peptic ulcer disease is no longer a chronic condition. Doctors no longer blame their patients for their taste for spicy foods or high-stress lifestyles. Rather, they cure most of their ulcer patients with an easy course of oral antibiotics that eradicates H. pylori from the stomach and duodenum. To these patients, Marshall and Warren are medical heroes. American Society for Microbiology. Timeline of Microbiology 1870s-1880s. 2002, (4 April 2004). Brandt AM. "Risk, Behavior, and Disease: Who is Responsible for Keeping Americans Healthy." In Major Problems in the History of American Medicine and Public Health, ed. John Harley Warner and Janet A. Tighe. Boston: Houghton Mifflin Company, 2001. 532-539. CDC Division of Bacterial and Mycotic Diseases. "Happy Ulcer Sufferers." H. pylori and Ulcers Public Service Announcements. (4 April 2004). Clinch D. Peptic Ulcer and Its Drug Causation: The Role of Non-Steroidal Anti-Inflammatory Drugs. London: Croom Helm, 1986. Deltenre M, Dekoster E, Nyst JF, and Y Glupczynski. "Why Should We Treat Helicobacter pylori Infection?" In Helicobacter pylori, Gastritis, and Peptic Ulcer, ed. P. Malfertheiner and H. Ditschuneit. Berlin: Springer-Verlag, 1990. 381-387. Feldman M. (1994). The Acid Test: Making Clinical Sense of the Consensus Conference on Helicobacter pylori. JAMA. 272(1):70-1. Graham, JR. (1995). Helicobacter pylori: Human Pathogen or Simply an Opportunist? Lancet 345: 1095-1097. Grob, GN. (2003). The Rise of Peptic Ulcer, 1900-1950. Perspectives in Biology and Medicine. 46(4):550-67. iConn, Connecticut Digital Library. InfoTrac OneFile. (16 March 2004). This article is an excellent history of P.U.D. in the first half of the twentieth century. Grob uses the history of P.U.D. in order to provide a nuanced view of the beginnings of modern medicine. Janulaityte-G&uuml;nther D, Thomas G, Pavilonis A and K Limas. (2003). What Bizzozero Never Could Imagine,Helicobacter pylori Today and Tomorrow. Medicina. 39(6):542-9. Levenstein S. (1998). Stress and Peptic Ulcer: Life Beyond Helicobacter. BMJ. 316: 538-41. Lynch NA. "Helicobacter pylori and Ulcers: a Paradigm Revisited." Breakthroughs in Bioscience . (4 April 2004). Marshall B. (2003). "Helicobacter pylori: Past, Present, and Future." The Keio Journal of Medicine. 52(2):80-5. Marshall B. "Preface," In Helicobacter pylori in Peptic Ulceration and Gastritis, ed. Barry Marshall, Richard W. McCallum, and Richard L. Guerrant. Boston: Blackwell Scientific Publications, 1991. xi-xii. Marshall, Barry J. "History of the Discovery of C. pylori." In Campylobacter pylori in Gastritis and Peptic Ulcer Disease, ed. Martin J. Blaser. New York: Igaku-Shoin, 1989. 7-23. Marshall BJ. (1995). Helicobacter pylori: The Etiological Agent for Peptic Ulcer. JAMA. 274(13):1064-6. Marshall BJ and JR Warren. (1984). Unidentified Curved Bacilli in the Stomach of Patients with Gastritis and Peptic Ulceration. Lancet. 2(8626/8627):1437-41. Munnangi S and S Amnon. (1997). Time Trends of Physician Visits and Treatment Patterns of Peptic Ulcer Disease in the United States. Archives of Internal Medicine. 157: 1489-94. NIH Consensus Development Panel on Helicobacter pylori in Peptic Ulcer Disease. (1994). Helicobacter pylori in Peptic Ulcer Disease. JAMA. 272(1):65-9. Rauws EAJ and GNJ Tytgat. (1990). Cure of Duodenal Ulcer Associated with Eradication of Helicobacter pylori. Lancet. 335:1233-5. Rees WDW. "Foreward." In Advances in Peptic Ulcer Pathogenesis, ed. W.D.W. Rees. Lancaster: MTP Press Limited, 1988. Rogers AI and D Hoel. (1997). Peptic Ulcer Disease: Retracing Science's Journey Through the Gut. Postgraduate Medicine. 102(5):158-64. Siepmann JP. H. pylori and Ulcers, a Forgotten Discovery. J Theoretics. 17 February 1999, (17 April 2004). Sobel R. Barry Marshall: A Gutsy Gulp Changes Medical Science. U.S. News and World Report. 20 August 2001, (17 April 2004). Spiro H. (1998). Peptic Ulcer: Moynihan's or Marshall's Disease? Lancet. 352:645-6. Sweet M. Gut Feeling Brings a Great Discovery. The Bulletin. 22 October 2003, (17 April 2004). Thagard P. (1998). Ulcers and Bacteria I: Discovery and Acceptance. Studies in History and Philosophy of Science. Part C: Studies in History and Philosophy of Biology and Biomedical Sciences. 29:107-36. (4 April 2004). Thagard P. (1998). Ulcers and Bacteria II: Instruments, Experiments, and Social Interactions. Studies in History and Philosophy of Science. Part C: Studies in History and Philosophy of Biology and Biomedical Sciences, (4 April 2004). Warren JR and BJ Marshall. (1983). Unidentified Curved Bacilli on Gastric Epithelium in Active Chronic Gastritis. Lancet. 8336:1273-5.